There is only one effective way to train on your fingerboard: the way it works for you. 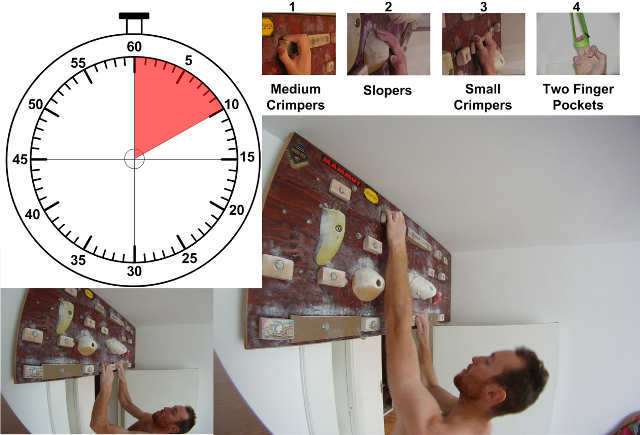 If you feel you don't know how to make best use of your hangboard then you must experiment until you see noticeable results in your outdoor rock climbing or in the gym. My experience with the workouts and then later with indoor climbing or bouldering led to the conclusion that for each climber there is different mix of training elements that works. So I guess knowing what works for you may be your biggest secret in your climbing. But if you feel like nothing works then I take the liberty to ask you some questions: How methodical is your training? How do you keep yourself motivated? Do you commit to your training 100%? It is not seldom that I find myself quitting my workout half way... It happens especially when I don't have a clear purpose about it. I just start doing some pull ups, a few dead hangs, maybe a bit of campusing and then I lie to myself like "Oh boy, that's enough!" when in fact it has only been 10 minutes since I started. Pretty lame, huh? So how to avoid situations like this and get serious with your forearm and finger training for your climbing practice? Don't think too much about the difficulty of the workout. Instead think about the rewarding feeling you will enjoy after finishing your training. The fatigue in your body, the soft soreness in your forearms and the mild pain in your fingers will give you a sense of accomplishment that will nurture your desire for this beautiful sport. Think about that and start doing those pull-ups on those crimpers. It's all about thinking about the positive aspects of getting in shape. Use a fingerboard training scheme. This is really important and I tell you why. Coz once you have those printed workout sequences in front of you, you cannot cheat anymore! You have to do it coz it's right there in front of your eyes and you will try harder to hold onto that sloper until the second-arrow-hand of the wall clock hits that 45 seconds mark. This will make you more rigorous and disciplined about your training and most importantly will bring visible results in strength and endurance a lot faster than informal "let's-see-how-it-goes" workouts. Design a few sets of training schemes that work for you and stick to them. Have hard workouts and light workouts but ensure that each of those will last anywhere between 30 minutes to 1.5 hours. Make your workouts consistent, cover all types of holds if possible and build strength gradually - push yourself to do harder stuff in small increments over a longer period of time. Don't spike your training chart as you may get injured. Depending on your character and personality you may wanna have a training partner. Seek the company of a friend that motivates you and train together looking to outwork each other in a constructive and playful way. Tacit and friendly competition builds up both body power and camaraderie. Climbing (and training for climbing) is not only a sport - it's a lifestyle and a social experience. Share your biggest training secrets with your fellows and you will all gain from that. Have fun coz that's what really matters! I also noticed that when I train on the fingerboard (alone) I finish my workout with a positive attitude thinking about myself that I am strong. This sense of power which is mostly in my mind than in my body is later translated onto the rock when I do on-sights or when I work on projects. I keep telling myself that I can do it and eventually I do it (sometimes I fail gloriously). This experience is contrasting against - say - a bouldering session when there's visible difference between me and other climbers (me being the weakest). In this case I get frustrated and depressed and thus my training ends with the thought that I'm lame and weak which later translates into even poorer climbing for me. So I can conclude it's important to know how to motivate yourself, how to keep yourself out of the negative influence of others but at the same time to challenge yourself, how to trick your mind and body that everything is possible and most importantly how to keep a humble attitude about your climbing. Lionel Terray who wrote Les Conquérants de l'inutile (EN: The Conquerors of the Useless) said something like "Even the hardest ascent is a trifle compared to other human realizations." Keep that in mind for those moments when you will redpoint your first 9a (or 5c) sport climbing route. Train wisely and go climbing!